Most fires that start in the home are from small accidental causes, most of them can be placed in the “I should have known better” category. Most home fires can be prevented with simple steps, this year, why don’t we put a stop to bad electrical habits. The electricians at Barlows Aire Force One know a few electrical fire prevention tips that can help you out in 2017. Extension cords that are coiled up can create a fire hazard, even those fancy cord reels are at risk, because flowing current generates heat, and when that heat cannot properly dispense because of the coiling, fires may occur. Wrapping or coiling is not just bad for extension cords, any cord can suffer damage as the metal components are bent causing the components to become weaker. Most of us have been there and done that. Yanking the cord out of the wall when we are done vacuuming or tugging on the extension cord from a few feet away to avoid the long walk to the outlet…Pulling the plug out of the wall by the cord may cause a spark and that spark could cause a house fire. Even if pulling the plug out of the wall by the cord doesn’t cause a spark it will reduce the lifespan fo the appliance and the outlet. 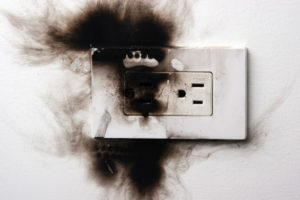 Plugging a 100-watt light bulb into a 35-watt max bulb socket can easily result in an electrical fire. Why? The wires in a light bulb become brittle when exposed to an excess amount of heat as a result of having a wattage that exceeds specifications. Light bulbs in enclosed fixtures are at a higher risk for fire because the heat is unable to dissipate as well. If a bulb overheats it can damage the fixture and melt the socket inside of it, causing a fire. Avoid placing electrical cords under carpets or rugs or fastening them with nails or staples. While loose electrical cords can also be a safety hazard (who hasn’t tripped over one at some point and time in their life? ), keeping them out of the way can sometimes do more harm than good. When you hide your cords under rugs or carpeting they can become damaged from the weight of individuals walking on them and the heat that the flowing current generates will not be able to dissipate as effectively, causing a fire. Stapling or nailing your cords down can result in the exposure of live wires, which can lead to an electrical shock as well as an electrical fire. Trying to attempt any electrical work without the proper experience or tools can result in major catastrophes. It is safer and, in most cases, is more cost effective to have a licensed electrician install, repair, and dismantle any electrical wiring in your home. Any electrician worth their salt, like the pros at Barlows Aire Force One, will complete all electrical work according to electrical safety codes, ensuring safety and a job well done.